We run for hope — because we can. It all began 14 years ago when a subcommittee of the Northern California Food Industries Circle tossed out the idea to run a marathon to raise money for the City of Hope, and everyone said, "I'm in!" Little did they know that the Run for Hope team would still be going all this time later — and stronger than ever. Eight to 10 runners have become 30 to 40 with teams from Northern California retailers, manufacturers and sales and marketing companies. This year the NCFIC Marathon Training takes the team to the beautiful California coast in Santa Barbara on Saturday, November 11th for the half marathon race (13.1 miles). 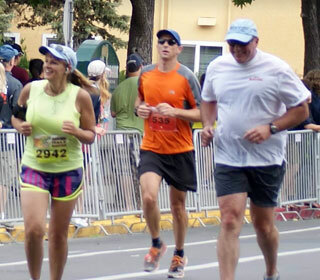 Each runner not only dedicates time in training, but also fundraises to earn at least $3,750 each. The team goal is to raise over $150,000 — hopefully with corporate sponsors that benefit the entire team. The training program provides runners and walkers of all fitness levels with the tools to complete their personal physical challenge. More importantly, every runner has their own personal story — we invite you to visit their personal pages to find out more about the passion that keeps our feet moving on the Run for Hope. It's not too early to join us- please consider participating or sponsoring an individual or our entire dedicated group of athletes. For more information, please contact Kalynn Blakely at kablakely@coh.org or call City of Hope's San Francisco Philanthropy Office at 415-788-1002. We've reached 113% of our $150,000 goal!